Elly has been blessed with a beautiful voice. And seriously people, it's not just me with all my motherly admiration. I have had people approach me and tell me she has such a clear beautiful voice. She has a natural gift my almost 8 year old. 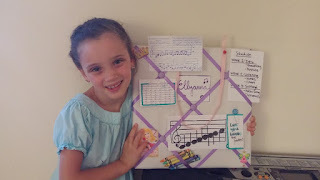 And so we know another young lady in our church who is equally as blessed start giving Elly voice lessons a few weeks ago. She loves it! And look what her teacher Mrs. Cecliy made!! Awesome!! 2) Set Up our Stage Props and have a Dress Rehearsal. The kids acted out the scenes where King Oberon puts the love potion in Queen Titiana's eyes and Puck puts the love potion in Lysanders' eyes. Then we see Hermia wake up asking where Lysander went, Lysander waking up and seeing Helena, tells her he loves her. Puck turns Nick Bottom into a donkey. Queen Titiana also awakes and beholds Nick Bottom the donkey and proclaims her love. 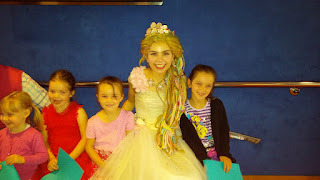 The kids REALLY enjoyed the acting!! What a great way to end camp!! 2) Anna gave us a lesson on the Theater and how Will Shakespeare got into writing and acting and creating a theater with friends. She showed us pictures and quizzed us. 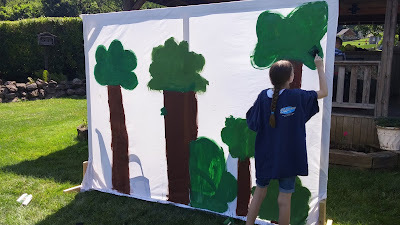 3) Craft Time: Then we set to it and got to creating props: Cardboard Trees and curtain backdrop to paint! It was a blast and impressive! 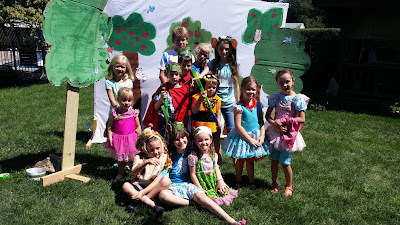 The kids also colored woodland animals and cut them out to go on our backdrop and trees. 4) Snack Time: We had apples, dip and nuts. In honor of the theater, because peasants would bring this kind of food along for the plays and if they didn't like the show they would throw it at them! 2) Then we sat down on blankets by a nearby tree (me on a chair) and I read to them the kids version of "A Midsummer Nights Dream." It was the Shakespeare Can be Fun version by Louis Burdett. It is great! I read in funny voices, act it out and ask questions every 2 pages. They were all very engaged! And I take a break half way through to play a game. 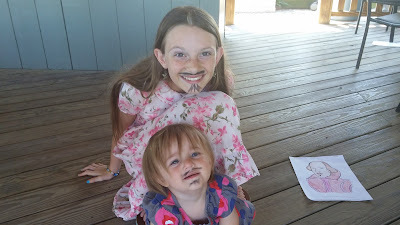 4) Craft Time and Face Painting! 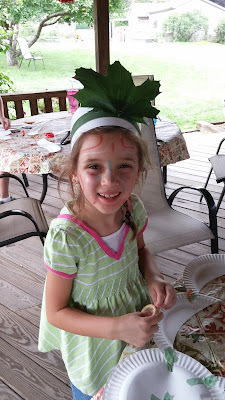 We made leaf crowns, paper plate wings and decorated water gun swords. Did more face painting. 6) Snack Time: Grapes, pretzels and bread: We finished up the book while everyone ate their snack. This week is Shakespeare Camp! 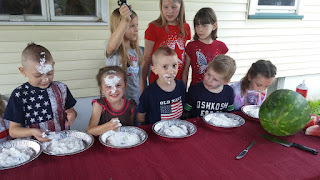 I have been hosting and organizing Summer Camps for five years now. Since basically my kids were so young they could not truly appreciate it. But that is alright because I love doing it and learn how to throw a camp together a little better each year. In the past we have done different themes: Native Americans, Little House on the Prairie, Around the World, Science Experiments and this year Shakespeare. The camp lasts four days and on the fifth day this year we will attend a local university to watch a kids version of Mid Summer Nights Dream. I will tell you the day by day version of our camp in individual posts. Today we will go over Monday. Review Our Lines in Song Form. We are memorizing some lines from Mid Summer Nights Dream. I set it to song (Skip to my Lou) and hand motions. Where oxlips and the nodding violet grows,"
Went to the carnival tonight. The girls went on a few rides and we got ice cream. We went with our friends the Boswells. Then we saw the most AMAZING fireworks. They were set to music and they were INTENSE!!! Seriously very Cool. We are prepping for a canoeing, camping trip this August. Little Hayzel is too small to truly enjoy it so grandparents will watch her. This evening we went with Elly and Brinley for an hour and a half. 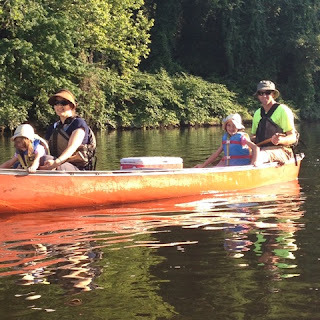 The Allreds helped us on our first family canoe trip ever. It was fun. Brinley was pretty scared but it was our first time so I suppose that could be expected. All in all it was good fun! I LOVE to plan a party and get in some learning at the same time!! 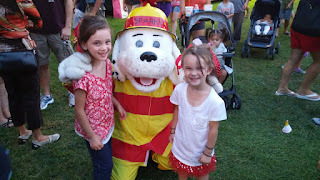 Well in June we managed to: 1) see a Rapunzel play 2) go on a pontoon boat ride 3)visit a lavender farm 4) participate in a one day science camp 5) have a poetry tea party with frienda 6) have a Fathers Day meal with Lawracys 7) visit Grandma Cooper and cousins at Cabelas and Cracker Barrel 8) have pioneer planning meeting with friends and girls got to make fruit loop necklaces there.